Went to a local Swedish fair today (yummy food!) 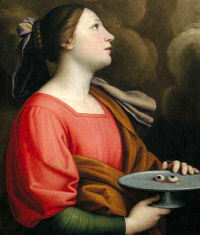 with friends and made a connection with Saint Lucia...or Saint Lucy as my (Italian) Grandmother calls her. anyway It's interesting seeing how religion/culture transforms from country to country. So interesting.... I have always loved the idea of Swedish celebration ... but oh my, the painting above !???!! theoretically it could also be russian eggs with black caviar...?